AEtrium System automation controls a suite of sensor based aeroponic growth environments. Providing secure remote access and cloud data storage, Guardian™ Grow Manager software automation controls an unlimited number of AEtrium-SmartFarm and AEtrium-4 growth environments. The Guardian software automation executes your nutrient dosing recipes and monitors the health of your plants with intelligent sensors while you relax with confidence. 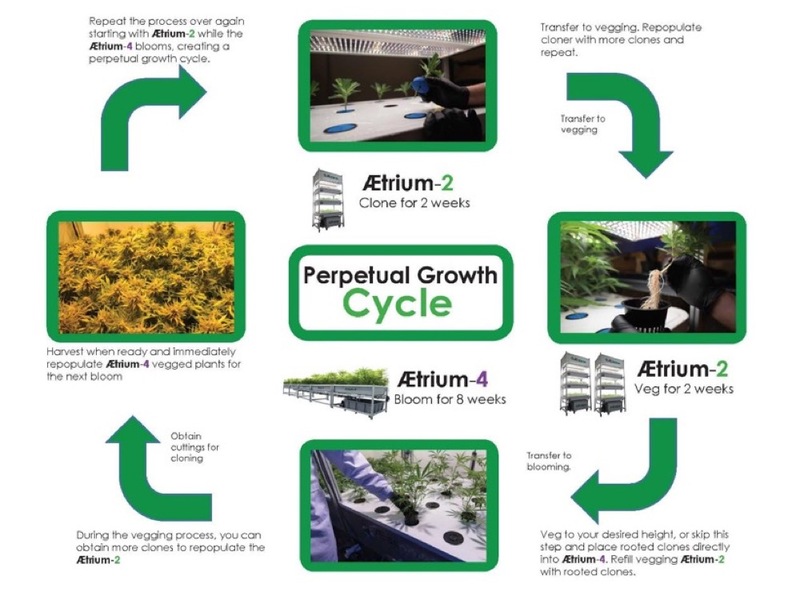 Delivering the full potential of precision controlled aeroponic growth, the AEtrium System delivers 40% more yield in the same space as growing in soil. On the aeroponic side, the main difference is the elimination of the inflow and outflow of new/used soil. This offers large savings in labor, headaches, and pest management. There will be water and nutrient savings from using aeroponics but the real advantage is the yield increase and the easy harvest turnaround (same day for your grow rooms). The automated monitoring of your pH, recipes, and grow cycles is all upside and lets you keep a personal life while running a tight operation. The AEtrium-2.1 SmartFarm for Cloning & Veg is a 4-layer vertical stacked platform. This unit produces 3024 fully automated clones every 10 days. It occupies 5 feet 3.5 inches wide by 16 feet 7 inches long and is 8 feet 8 inches tall. The SmartFarm is fully automated; just plug in water and power, and you're in production. The AEtrium-4 is our production Blooming machine. This modular system comes in 2 to 10 tub "trains" (10 tubs in a train are 4 feet wide x 50 feet long). There is one dynamic nutrient dosing matriarch at the head of the train. This matriarch samples, senses, doses nutrients, and irrigates your plants on the irrigation cycle that you specify. We provide recommended NPK, pH, and CALiMAGic levels but you can adjust these recipes as you prefer. The latest video walkthrough of the AEtrium-4 is here. The final and most important piece of the system is our GuardianTM Grow Manager automation software. The Guardian holds and executes your grow plan. It logs and manages all of the dosing, irrigation, status, loading, and management of your grow environment. It monitors CO2, humidity, NPK, pH, temperature, water refill or empty, and cleans the system on plan with hydrogen peroxide to avoid any type of fungal growth during your cycle. Your grow plan or multiple grow plan experiments can be deployed to 1 or many rooms on the schedule that you have in mind. The Guardian monitors all of the levels that you set and notifies you through text or emails of tasks, low level, and urgent alerts. There is a video on the Guardian software at the above link. Please sign up for our newsletter for our latest Test Kitchen reports.